Confirmation Bias is the tendency of people to favor information that confirms their own beliefs, goals or desired outcomes (and ignore what doesn’t fit). A business example of confirmation bias is the hugely popular personality-type quizzes (e.g. which ‘Beatle member are you?’ or ‘What type of Ice Cream are you?’). When people take those quizzes they are typically reaffirming the opinion they already have in their mind (“I’m Mick Jagger of course”). A trick of those quizzes is that most of the successful ones return you results that are positive (you’re unlikely to find one that asks ‘Which mass murderer are you?). 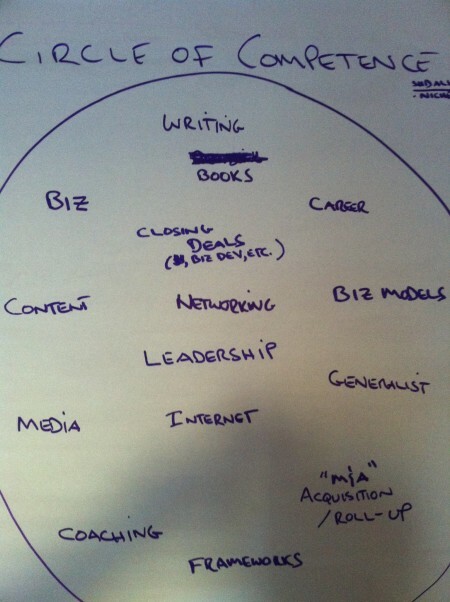 The Circle of Competence was one of the most important exercises I did before founding our current company Ongig. Business Is Like A Decathlon: Be Decent At These 10 Things & You’ll Win The Gold! I’d love to see your face on a box of Wheaties. The Olympic decathlon — a combined event of 10 different track and field races — is a perfect metaphor for business. Bruce Jenner didn't have to win every one of the 10 races in the Olympic decathlon to win the gold. You can actually win the decathlon without being the best at any of the 10 races. 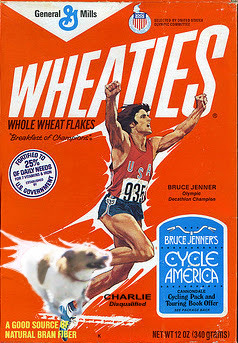 In fact, Bruce Jenner (winner of the 1976 Olympic Decathlon and pictured on the Wheaties box) averaged the equivalent of a little better than 3rd place in each race — and he still won the decathlon by a substantial margin. Charlie Munger refers to a “latticework of about 100 mental models” that he and Warren Buffett credit for their successful investing. Munger points out that if you don’t master the “multidisciplinary” approach of such “mental constructs”, you will remain in the “middle ranks” or “shallows” in life. 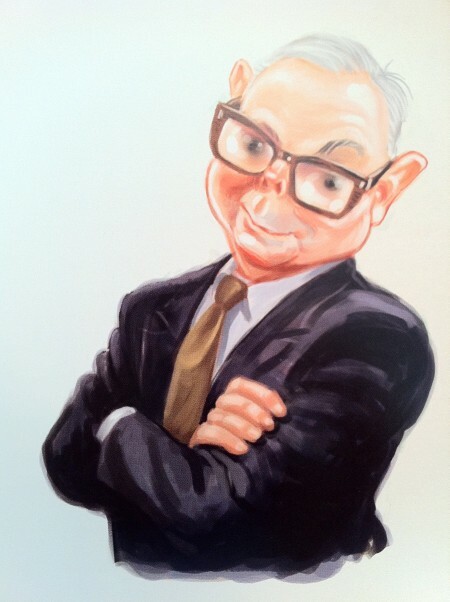 I’m fascinated by these models, and their application to business (not just investing) and life, and decided to keep a list of ones I run across (some are related to Munger and others I’ve learned about elsewhere (but believe Munger might appreciate)). Why would my friends work with someone who’s “narcissistic?” Because they are charismatic — they are able to mobilize resources (i.e. you and others!) through their charisma. Gordon Gekko is an excellent example of a "Charisma-Based Narcissistic Leader"
The scary part is that these charismatic leaders usually meet 2 of the 3 requirements that Warren Buffett demands in a good business person (high intelligence and high energy) — it’s the third one (high integrity) they have a problem with (see Warren Buffett’s 3 Simple Steps On Who To Hire for more on that). Narcissistic leaders typically love big titles…and even more than one! I’ve been thinking a lot about hiring lately. I’m working on starting a new business and I also coach others on starting their own businesses – and hiring is perhaps the most important decision a business leader can make (you may recall how I previously wrote about a mishire costing you a cool $1 million). I like formulas & frameworks and I’ve been keeping my eye out for a good one for hiring – I found a simple one from investor Warren Buffett. He says there are just 3 criteria that every good hire should have: Integrity, Intelligence and Energy. Does this person consistently exhibit a soundness of character? Are they, in a word, honest? One good tip on figuring this out is to use Warren Buffett’s “newspaper front page” test. Let’s pretend the potential hire is named Bernard. If a New York Times reporter had access to the work that Bernard did for you, would you comfortable opening up the paper tomorrow and reading their analysis of Bernard? If the answer is yes, Bernard is probably of good integrity…if you’re thinking too much about that, you might have a problem with old Bernie. Did a person test well in a competitive environment (such as grades in University or on a standardized test like the SATs). I just met with one engineer today in part because he scored a 1,480 on his SATs and that’s higher than most people I know. But it doesn’t have to be academic intelligence. It can be “Street Smarts” – The ability to quickly read situations and people. Or it could be “Emotional Intelligence” – the skills to create optimal results in your relationship with yourself and others. Good energy in a hire is when they feel motivated about a task at hand. For example, most people consider me high-energy about most things: I care deeply about new Internet businesses, hiring & making the world a better place – so when I’m working on those things, you’ll find me at a high-energy level. But there are tasks that you’ll find me much lower energy on, such as paying my bills or filling out a rebate form to get $100 back for my contact lenses. So, if you need help with your paperwork, please do not consider me a good candidate! Now, ideally you want all three criteria — Integrity, Intelligence and Energy — to be met when hiring employees. But there is one that trumps them all: Integrity. The reason, as Buffett explains, is that if you have the other two: an intelligent person who is high-energy about what they’re doing, but they’re missing the third (they are low-integrity (e.g. dishonest)), then that is a Perfect Storm of financial disaster. Case in point: Bernie Madoff (you like how I moved to the real -life Bernie from the hypothetical “Bernard”?). Clearly, Bernie was an intelligent man – he had the respect of a Who’s Who of Wall Street people. And he was high-energy at what he did– was able to talk 1,000’s of people into hiring him to manage their savings; and hid his fraud for what investigators believe was over 30 years! He even duped a couple of very smart people I know. And Bernie served on a number of boards (including Yeshiva University’s Business School and Gift of Life Bone Marrow Foundation) and was clearly a high-energy multi-tasker. So, I think Bernie qualifes as an intelligent and energized person…but he was low-integrity…and he robbed people blind. But to save yourself time, make sure they have the first (Integrity) because the next two don’t matter without it. I found this terrific video (below) in which Buffett teaches students how to become the business hero they want to be (the video is pretty crappy quality but fantastic content!). As Buffett explains, you don’t have to be a student to benefit from this exercise, but the earlier in life you do it the better! Write down the qualities of that person you want to own 10% of on the left-hand side of a piece of paper. 2) Pick a person who you would like to “sell short” based on their performance for life. Write down the qualities of this person you want to “sell short’ on the right-hand side of your sheet of paper. 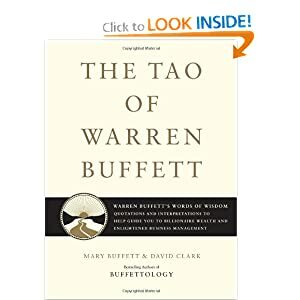 Buffett suggests that if you focus on emulating the qualities on the left-hand side and avoiding the qualities on the right-hand side, you’ll eventually become the person that you want to own 10% of. But even better than owning 10% of that person, you’ll own 100% of that person…because it’s yourself!